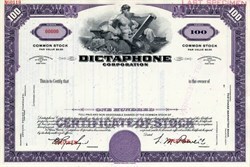 Beautiful engraved specimen certificate from the Dictaphone Corporation printed around 1975. This historic document was printed by American Bank Note Company and has an ornate border around it with a vignette of an allegorical man. This item has the printed signatures of the Company's President and Secretary and is over 41 years old. A Dictaphone advertisement from 1917. After relying on wax cylinder recording through the end of World War II, in 1947 Dictaphone introduced their Dictabelt technology, which cut a mechanical groove into a plastic belt instead of into a wax cylinder. This was later replaced by magnetic tape recording and eventually hard-drive recording.